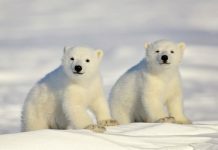 How Polar Bears are affected by Global Warming? Polar bears are one of the few Arctic animals that rely on sea ice for their prey. As the Arctic sea ice melts the bear becomes redundant. This is probably the biggest threat to polar bears as it seems more likely than before that they are going to be extinct no later than 2060. The bizarre response of some of the countries regarding climate change is worsening polar bear’s prospects each passing day. 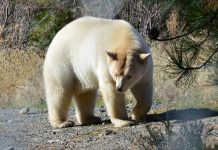 The global warming is one of the vital reasons as to why the polar bear is in danger of extinction. Polar bears are not endangered they are threatened. Scientists hope that if we manage to stop the rate at which earth’s surface is warming we can surely restore the bear’s population as it was 100 years ago. 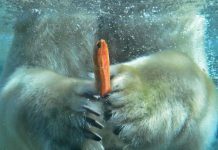 If the ice stops melting the bear can hunt, eat, sleep (in dens) and find mate to reproduce. This will probably increase the chances of polar bear’s survival in the Arctic. While they are excellent swimmers bears can’t navigate the entire arctic in swimming. They must search for the sea ice or they die either of starvation or drowned. 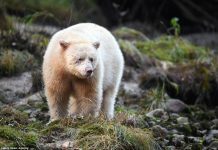 The climate change hit white bears the hardest as their only habitat is going to be vanished soon. According to the U.S. Fish and Wildlife Service “the single most important achievement for polar bear conservation is decisive action to address Arctic warming”. Polar bears hunt seals on the sea ice. If there’s no ice there is no hunt. It is that simple. Rapid climate change causes the global average temperature to rise and as it turns out the Arctic ice declines ever than before. The report of National Oceanic and Atmospheric Administration (NOAA) shows that the air temperature at high altitude increases twice as fast as the temperature at the lower altitude. This is a major concern for us all. 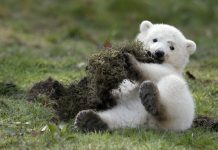 Let’s see in what ways polar bears are affected by climate change. The climate change has caused long summers and short winter. The rise in temperature has also led to incomplete refreeze in winter. Now polar bears must prey and learn how to survive on land. Furthermore they are going to spend more months in starvation. 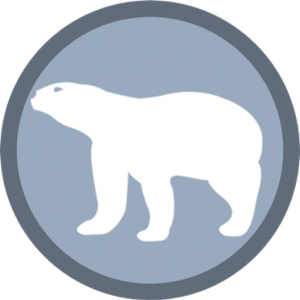 The International Union for the Conservation of Nature (IUCN) insists that the ice-free periods are going to spread the hunger among white bears. Furthermore they said that the climate change is pushing polar bears over a tipping point. The single most important achievement for polar bear conservation is decisive action to address Arctic warming. Since the year 1979 the arctic sea ice diminishes at a rate of 14% each year. The fourth lowest ice recorded in the year 2016. As the global climate gets warmer the Arctic glaciers and icebergs transform into water. Polar bears must swim greater distances in search of prey. 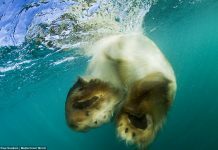 While they are excellent swimmers bears can’t navigate the entire arctic in swimming. They must search for the sea ice or they die either of starvation or drowned. The more distance they cover in swimming the more fats they consume. Consequently bears let alone female bears lose weight and find it difficult to feed cubs. Over the past few decades polar bears have been forced to leave their original icy habitat. None of them ever live in Antarctica but scientists have spotted few individuals moving in Antarctica. This shows a significant change in polar bear’s behavior. Scientists maintain that climate change is probably the major cause of polar bear’s migration. The arctic ice disappears and the prey becomes scarce. Polar bears must devise new hunting methods and food source on which they can survive. They are not adapted to warmer climate but they need to for it’ll become an inescapable necessity in the years to come. They must also learn to eat human rubbish, small animals and whale carcass which were never the part of polar bear’s diet. Few people believe that the endangerment of polar bears is highly exaggerated. They see an increase in population since 1960s when there was no legal restriction on hunting. However the truth is that the entire population is classified into 19 subpopulations many of which are thought to be declining. The population of Kane Basin and Baffin Bay are declining rapidly. Biologists fear that 80% of the current population soon fades away if the rate of global warming continues in a way it is. The southern Beaufort Sea population is known to be stabilized which is pretty good news. The numbers saw a rapid decline since the beginning of the 20th century. As of now the population is stable at 900.